Your wheat has been planted and has established well. What do you need to focus on in the time from planting your crop until the stems starts to elongate? This is the period of the growing season where you as farmer can play a major role in the eventual success of the wheat crop. Although the type of season you are experiencing will play a major role in your management decisions, the aim is still to ensure that there is enough food for the growing plant, that there is no competition from weeds and that you are prepared to protect the plant from disease. The first 40 days in the life of a wheat plant is very important. It is during this period that the yield potential of the crop is maximised. What do we mean by that? It is during this timeframe that the number of tillers are formed (more tillers = more possible ears), the number of spikelets per ear and the number of flowers per spikelet is initiated (more spikelets and flowers per spikelet = more potential number of kernels). We are striving to get the potential as high as possible, because once we have established the potential it will never increase, but can always decrease, which leads to lower yields. So, the first step is to ensure that there is enough food for the plant. Some of the total fertiliser for the season you have placed with the seed (if you have a planter) or broadcasted before sowing (old school style). This usually serves as a starter to get the crop growing once it has emerged. Initially the wheat plant requires very low amounts of nitrogen for its growth, but as the season progresses and the more and more leaves are formed, the need increases. It might therefore be necessary to give the first topdressing within the first 40 days. A lack of enough available nitrogen will lower the formation of the yield potential. Depending on your production system (either conventional or conservation agricultural) your soil might be able to deliver nitrogen to the growing wheat plant which might lower the need for high amounts of extra fertiliser (more so if you have a legume in your crop rotation), but always be careful to know what is available and how much you might need. Soil samples can be sent to certain soil labs to determine the amount of available nitrogen in your soil at the start of the season, which can help with planning your total amount of fertiliser to be applied during the season. There is also biological tests available to determine the amount of nitrogen available to the plant. Post emergence weed control is also very essential during this period because weeds are strong competitors for light, moisture and nutrients. Broadleaf weeds are the easiest to control in the wheat crop and a wide range of herbicides are available for control. Managing grass weeds is not so easy and selective herbicides are needed to control these weeds. It is also important to alternate your herbicide’s mode of action to prevent herbicide resistance. The application rate is important because if the application rate is too high or too low it can also speed up the occurrence of herbicide resistance. Make sure and read the label very carefully. Diseases can also limit the yield potential. 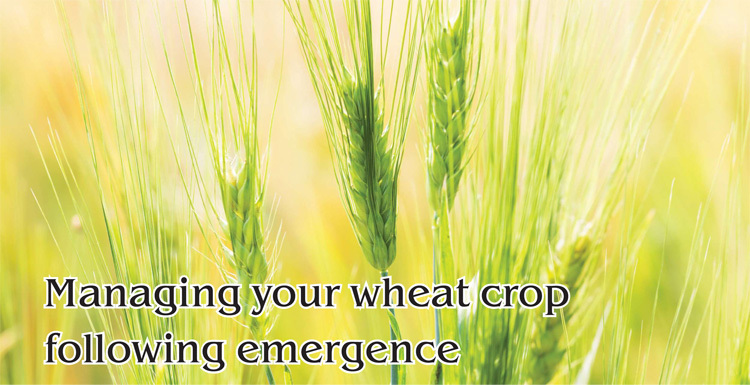 There are some seed treatments available that will protect the early growth of the wheat plant against certain fungal diseases as well as against insect predation. Once the yield potential is established we need to protect the crop to ensure that we reach our maximum possible yield. The optimum timing for foliar application of fungicides in cereals is from the start of stem elongation to ear emergence. This period coincides with the emergence of the four most important leaves in the crop and the ear. The leaves are the factories that convert sunlight and CO2 into yield, so any disease that reduces either the number of leaves or reduces the area available for photosynthesis will reduce the potential yield. It is also important to remember that leaves that have not emerged at the time of the application will not be properly protected and it might be necessary to do a second application. Our aim should be to keep the plant as healthy as possible to ensure that we maximise our potential yield as well as maintaining that potential yield. Be sure to walk through your crops as often as possible so that you can be pro-active and not reactive in managing your wheat crop. Article submitted by Dr Johann Strauss, Directorate Plant Sciences, Research and Technology Development Services, Department of Agriculture Western Cape. For more information, send an email to johannst@elsenburg.com.